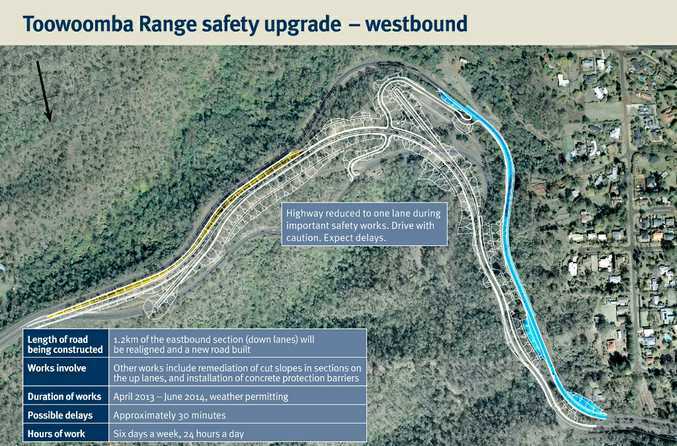 UNAVOIDABLE delays on the Toowoomba Range are set to test motorists with massive works to start on the Toowoomba Range in coming weeks. The Department of Transport and Main Roads will begin a safety upgrade of the Range on Monday, April 15 as part of Operation Queensland. A Department spokesman said the works, scheduled to finish in early 2014, would require some limited lane closures and temporary speed reductions. Are you happy to put up with a year of delays if it means the Toowoomba Range will be safer to travel on? As a result, delays of up to half an hour are predicted. >>> How will the works affect you? Let us know in the comments below. Works scheduled for the down section of The Range. The upgrades have been designed to reduce the risk of rock fall and land slide in all weather conditions. 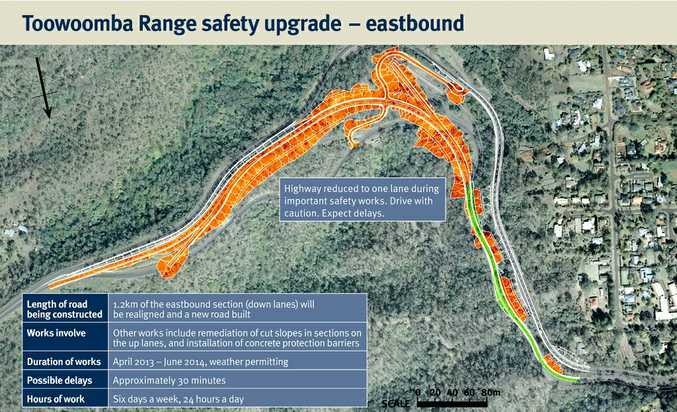 Works being carried out on both the up and down sections of the Range include 1.2km of the eastbound section being realigned and a new road built, the construction of two new truck safety ramps (one on the left side and one on the right) as well as upgrading barriers and drainage. Works scheduled for the up section of the The Range. Large sections of the sloping roadside will also be excavated to widen the carriageways and improve safety. The works will be carried out six days a week, 24 hours a day until they are completed.